Foresight Energy is a leading coal producer in the Illinois Basin Region of the U.S. with 1.7 billion tons of coal reserves currently supporting three mining complexes. We have invested heavily in logistics to give each of these mining complexes multiple modes of transportation to the end user of our coal; including rail, barge and truck. Our low cost operations and transportation options enable us to serve a wide variety of customers in both the domestic and international markets. Foresight Energy’s 1.7 billion tons of coal reserves located in central and southern Illinois are primarily contained in three large contiguous blocks supporting three active mining complexes. The thick coal seams and consistent geology are well suited to support highly productive and low-cost longwall mining. As a result our mines consistently rank among the most productive underground mines in the U.S. with Williamson and Sugar Camp ranked number 1 and 4 in 2017 as measured by clean tons per man hour worked. We have three longwalls in place and have the ability to add up to three additional longwall systems without increasing our reserve base. The heat content of the mines in our reserve base ranges from 10,800 Btu/lb to nearly 11,900 Btu/lb. Below you will find additional information on each of our mines. Macoupin Energy, located in Macoupin County, in central Illinois, operates two continuous miner sections with a Flexible Conveyor Train, one of the only ones used in the industry. Shay #1 Mine began coal production in 2009. 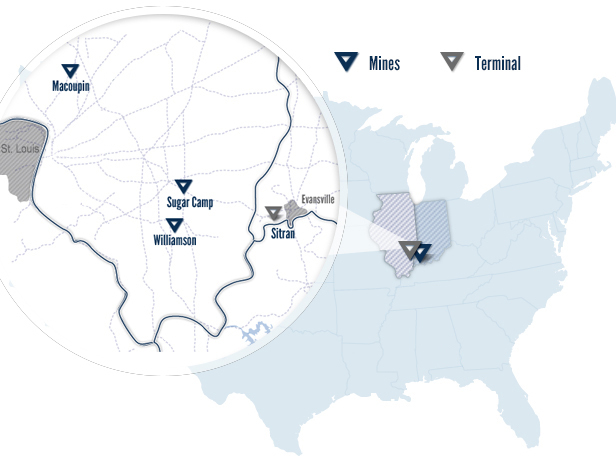 Sugar Camp Energy’s mining complex, located in Franklin County, in southern Illinois, contains 1.3 billion tons of clean, recoverable coal reserves and is designed to support up to 4 separate longwall mines. We operate two longwall mines that share common surface infrastructure but maintain separate access points for mine personnel and equipment. We began operation of our first longwall mine, M Class #1 Mine, in the first quarter of 2012 and our second longwall mine, Viking Energy, at the end of the second quarter of 2014. Note: Viking and M-Class report their production and safety data as a single mining complex in the Mine Safety and Health Administration (“MSHA”) website. Williamson Energy’s Pond Creek No 1 Mine, located in Williamson and Franklin Counties, in southern Illinois, was our first greenfield project. We began development in 2005 and started its longwall operation in 2008. Williamson was the most productive underground coal mine in the United States during the first five years of its history based on clean tons produced per man hour worked—according to MSHA data. It reclaimed this title in 2017. We believe maintaining our position, as a low-cost producer is critical to our long-term success. Equally important is keeping the cost of coal low on a delivered basis for our customers. To ensure low delivered costs and to increase the number of customers we can efficiently reach, we invested a significant level of capital to obtain a variety of transportation alternatives for our coal. Our transportation infrastructure includes rail load-outs, rail spurs, and truck load-outs. We also have secured access to river and export terminals under contractual throughput arrangements. For example, each of our mining complexes have access to multiple railroad lines which promise two benefits. First, we are able to get competitive rates from our transportation carriers, and second, each respective rail line provides an expanded market for our coal. The following chart summarizes the range of available transportation options for each of our mining complexes. To further control and minimize transportation costs as well as provide added flexibility, Foresight directly owns or leases three locomotives and more than 1,000 railcars. Sitran Terminal is a wholly owned transloading facility located at milepost 817.5 on the Ohio River commissioned in April 2012. It is capable of receiving up to 150 car train sets from mines originating on the NS, CSX and BN Railroads via the Evansville Western Railroad. The facility has blending capabilities and can store over 1 million tons of coal. The throughput capacity is in excess of 20 million tons per year.